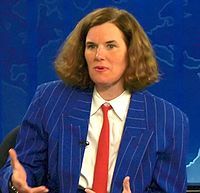 Paula Poundstone is an American stand-up comedian, well-known for her self-deprecating style and masculine dress sense. Poundstone attended Lincoln-Sudbury Regional High School, but dropped out to pursue a show business career. Her jobs have included bussing tables and working as a bicycle messenger. She started doing stand-up comedy on open-mike nights in Boston in 1979 and then relocated to California. In 1984, Poundstone was cast in the movie Hyperspace but she did not follow through on a potential acting career. Instead she became better known as a comedian and began appearing on several talk shows. In 1989, she won the American Comedy Award for "Best Female Stand-Up Comic". In 1990, she wrote and starred in an HBO special called Cats, Cops and Stuff and subsequently won a CableACE Award for the show. She worked as a political correspondent for the Tonight Show during the 1992 presidential campaign. She did the same for The Rosie O'Donnell Show in 1996. In 1993, Poundstone won a second CableACE Award, began writing a regular column, "Hey, Paula!" for Mother Jones (1993-1998), and had a variety show, The Paula Poundstone Show, on ABC (which lasted only two episodes). She was a regular panelist for the game shows Hollywood Squares and To Tell the Truth. Poundstone voiced Judge Stone on Science Court, an edutainment cartoon series done in Squigglevision shown on ABC Kids in 1997. She was the original voice of Paula Small for the first five episodes of the cartoon series Home Movies, which aired on UPN, but she left the show when it moved to Cartoon Network and was replaced by Janine Ditullio. The character's name and appearance were modeled after Poundstone. She is number 88 on Comedy Central's list of the 100 greatest standups of all time, and number 7 on Maxim's list of "Worst Comedians of All Time". She had her own Bravo special as part of their three-part Funny Girls series, along with Caroline Rhea and Joan Rivers. It was entitled, "Look What the Cat Dragged In." Around the same time as her Bravo special, Poundstone also released her first book entitled There Is Nothing in this Book That I Meant to Say. Described as an autobiography that is "part memoir, part monologue", the book intertwines historical biographies with anecdotes from her own life. She replaced Kevin Nealon at the 2006 Public Library Association convention in Minneapolis. Most recently, she has appeared frequently as a panelist on the radio news quiz show Wait Wait... Don't Tell Me! on National Public Radio. Also, she is a regular guest on A Prairie Home Companion, often appearing in shows in Los Angeles or at joke shows.